I’d like to take this moment to consider an ingredient so exotic to most and rare(ly purchased in this household), but so full of wonder and potential…I give you the plátano, or plantain. Unripe plantains are a starchy, less sweet version of bananas. The skin, thicker than a banana’s, comes in tropical green, but changes color as it ripens, to yellow, brown and eventually black. The flavor of the plantain also changes as it ripens, from tannic and starchy to creamy and sweet. People often confuse spoiled black bananas with perfectly ripe black plantains. Trust me, black plantains are good so don’t toss ‘em out! Plantains are a tropical fruit but are now widely available, especially here in Southern California. 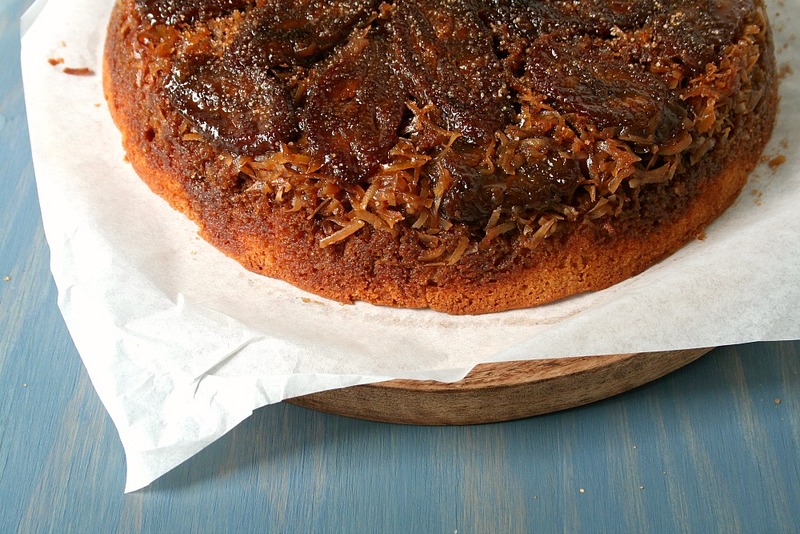 They have tremendous potential in savory dishes as a potato substitute, because of its starchy flesh, but ripe plantains also make killer desserts, like this Upside Down Plantain Cake. The taste, you ask? The really ripe and delicious plantains do indeed have a banana-like flavor, but it moves beyond that to tasting like caramel and maybe mangos; earthy, yet tropical and sweet. You definitely won’t mistake it for bananas. It’s true, I usually make tostones, which are pieces of not-so-ripe plantain that are mashed flat and fried like a thick chip, usually twice, and topped with guisados or drizzled with thick Mexican cream. While making and eating tostones is a perfectly acceptable way to enjoy plantains, there is so much more. For my part, moving beyond tostones was the first step. Stephen has made simple desserts with the ripened platanos just by baking them with sugar and cinnamon and adding a scoop of vanilla ice cream on top. Try this recipe and tell me what you think. Or stay tuned for our plantain dough empanadas and plantain soup. For now, let me present you with a plantain dessert fashioned after my Upside Down Loquat Cake, which is a hit every year, and unlike loquats, plantains are available pretty much year-round. 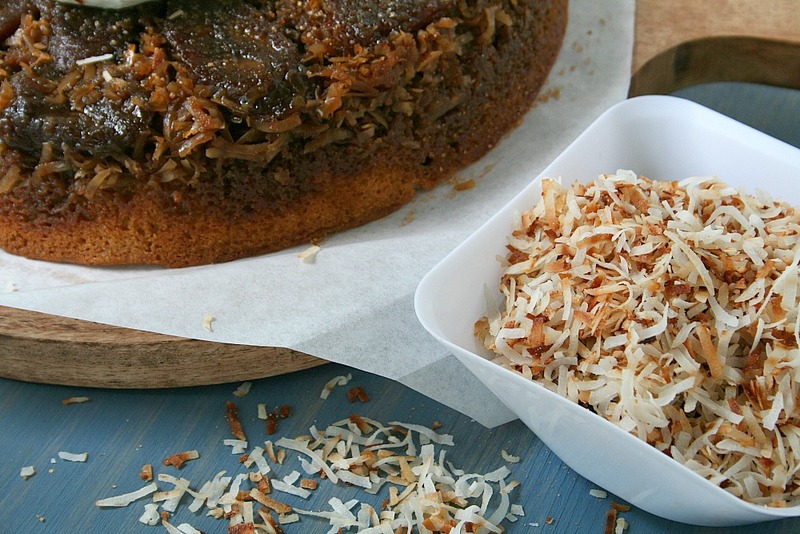 It seemed impossible not to add sweetened coconut to this cake, both in the cake and to top it off. Lightly toasting in a dry skillet is all you’ll need to bring out the natural oils that give coconut its distinctive aroma. Just be sure to keep your eye on it because it can go from zero to ash in minutes. In an 8-9 inch cast iron skillet, begin melting the butter and sugar over medium heat. You may need to whisk gently to incorporate. Preheat your oven to 350°F. Meanwhile, peel and slice the plantains into ¼ – ½ inch rounds, or on the bias. Carefully place the plantain rounds in the sugar and butter mixture. (Remember that it’s an upside down cake so be thoughtful in the placement. The easiest way to make it look pretty is to start in the middle and work your way out.) Evenly scatter the shredded coconut over the plantains. Allow the plantains to cook for about 5-8 minutes until the plantains are mostly cooked through. Remove from the heat and reserve until your batter is ready. Prepare your batter: sift together or whisk together the salt, cinnamon, baking soda, baking powder, and flour. (Whisking will help to aerate and mix together your dry ingredients.) Reserve. In a stand mixer, cream the butter and white sugar on medium. Reduce to low and beat in one egg at a time until fully incorporated. Then add in the vanilla and milk. Slowly mix in the reserved sifted flour (on low speed) until just fully mixed. Evenly spread the batter over the plantains and coconut. Bake for 35-40 minutes. (A toothpick should come out clean.) Allow to cool slightly before flipping the cake over onto a serving platter, plate or cake plate. 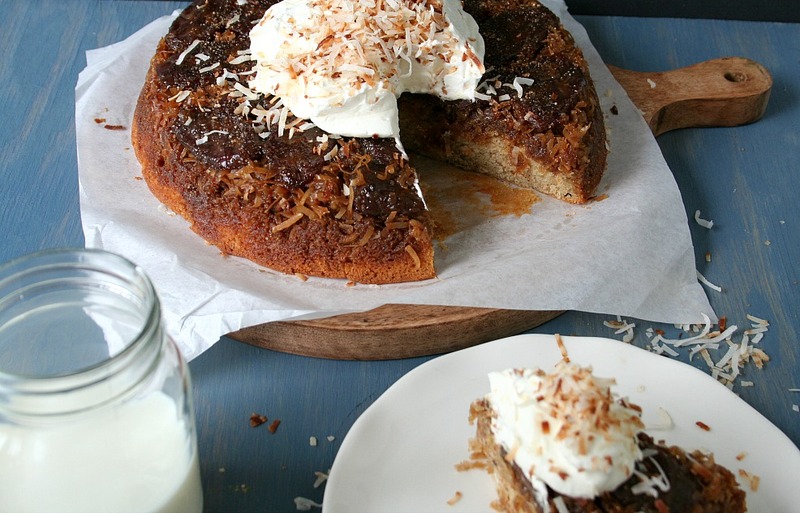 Enjoy warm with a dollop of lightly sweetened whipped cream and toasted sweetened coconut. And as always, please be careful when working with super-hot sugar because nothing will deflate your cake (and ego) as an emergency trip to the E.R. Love plantains and coconuts, so YES PLEASE! It was better than my cheesecake…and that recipe got me hitched! Ok this is good. Had a couple friends for dinner and this really topped it off. Used your hatch chili pork recipe too. Wow. When living in Panama whose food is bland, and plantains are plentiful, ours mouths were watering. This is so cool to hear. 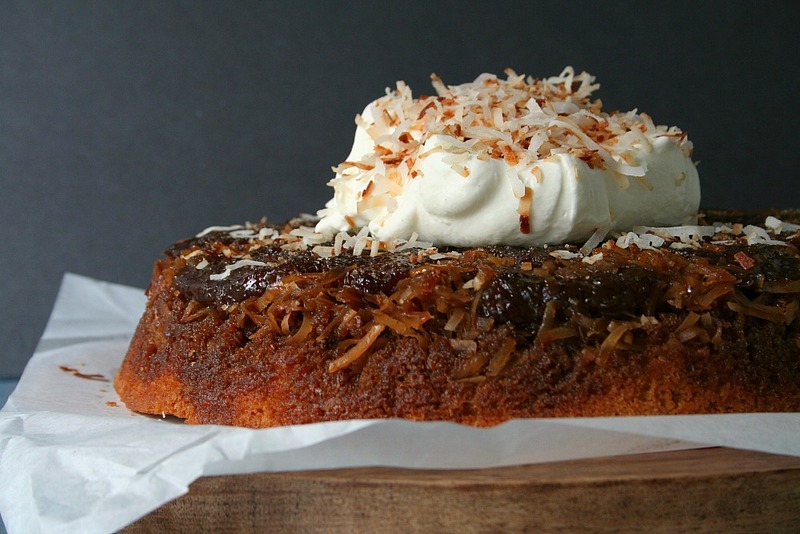 We love the Upside Down Plantain Cake. Sabrosa!